Thank you for visiting our website and your interest in our hospital! We are located in beautiful 4S Ranch and have been serving the community since 2007. It is our mission to treat each and every patient in our hospital with care and compassion, as if they were our own. 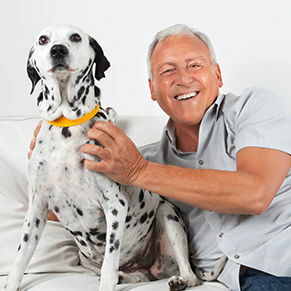 Our motto, "Providing individualized pet care by design," is one that each of our staff members, including Dr. Bruce L. Barnes and Dr. Daniel J. Gutman strongly support and work to uphold daily. By taking into account the individual needs of each and every patient, our goal is to design the best veterinary care necessary to keep your pet strong, happy and healthy! Please visit the "About Us"tab and click "4 Paws Staff" to find out more about all of our staff. Video Otoscopy The most effective way to visualize, clean and remove foreign material in your pets ears. Video Rhinoscopy Gives the doctor the ability to view, biopsy and remove any foreign object from your pets nose. Video Cystoscopy This procedure lets the doctor view and pass through the urethra into the bladder which allows for biopsy and possible stone removal. We are not just a veterinary hospital we also offer Grooming and Boarding for your convenience click here to find out more! At 4 Paws Animal Hospital we treat your pets like the valued family members they are. 4 Paws Animal Hospital is an accredited member of the American Animal Hospital Association (AAHA). 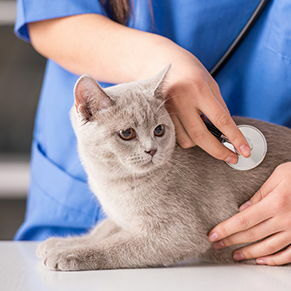 We will regularly undergo inspections by AAHA to ensure that we comply with the association’s high quality standards of care. Our latest accreditation took place in February 2018 where we passed with flying colors! These standards cover nearly every aspect of our hospital including: surgery, pharmacy, laboratory, exam facilities, pet health records, cleanliness, emergency services, dental and nursing care, diagnostic imaging, and anesthesiology. Approximately 15 percent of animal hospitals in North America are accredited by AAHA. This is a great honor to share with our clients and patients! Dr. Bruce L. Barnes had been practicing in the community of Ranch Bernardo for 5 years prior to working as a relief Veterinarian at over 20 hospitals in the City of San Diego. Dr. Barnes grew up in San Diego in the community of Scripps Ranch. Dr. Daniel J. Gutman was born just outside of Vancouver, British Columbia, Canada and spent a very active childhood and adolescence in Mesa, Arizona. He had various pets from gerbils to snakes and knew from a young age that he wanted to pursue veterinary medicine. Dr. Gutman earned his bachelor's degree in physiology and neuroscience at UC San Diego in 2010, prior to completion of a master's degree of biomedical sciences at Colorado State University in 2012. He spent most of his spare time volunteering and working at veterinary hospitals, wildlife rehabilitation centers, and rescue organizations prior to acceptance to the DVM program at Western University of Health Sciences in Pomona, CA. Dr. Gutman led the WesternU necropsy team at the Marine Mammal Care Center in San Pedro, played an active role in the Southern California Veterinary Medical Association, the student chapter of American Holistic Veterinary Medical Association. 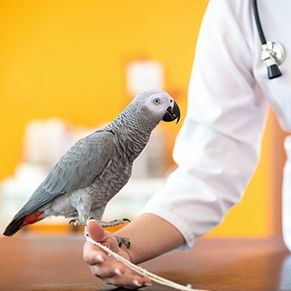 Dr. Gutman is an active member of the American, Canadian, California, and Southern California Veterinary Medical Associations as well as the American Academy of Veterinary Nutrition. His medical interests peak with neurology, surgery, and integrative/holistic medicine with a focus on preventative care. He is planning on becoming certified for acupuncture and volunteering with local humane societies and marine mammal rescue organizations. Dr. Gutman loves the San Diego community for the plethora of outdoor activities that humans can share with their furry family members. When he is not at the clinic, he will either be spending time with his one eared rescue dog, Lyla or out in the ocean with a big smile on his face. Ally was born and raised in Del Mar, and graduated from The Ohio State University with a degree in Animal Sciences and minors in Animal Bioscience, Animal Nutrition, and Equine Science. She is happy to be back in sunny San Diego and loves working at 4 Paws Animal Hospital - providing excellent medical care to the patients. Ally has been in the veterinary field since 2009 and working with animals is her passion. Her favorite aspects of veterinary medicine are emergency / critical care, surgery, and dentistry. In her free time you can find Ally at the beach, hiking, or running around Encinitas. Go bucks! Brigjette has been a vet assistant for 10 years and has been with 4 Paws for over 8 years. She loves phlebotomy and helping dogs in crisis return back to their normal happy selves. She has a puggle / chihuahua at home named Rascal that loves to sunbathe. She has two boys Caleb (7) and Noah (4) and loves to be active with her kids - hiking, fishing, and running. Bri knew she wanted to work with animals from an early age. She has worked in the field for 7 years and with 4 Paws since 2015. She has two dogs at home, a king charles cavalier named Fancy and a yorkie named Louis. Bri's dream job is to run a rescue / senior hospice care center. In her spare time she likes to take her dogs to Fiesta Island and have tacos or pizza. Karla is a Los Angeles native that moved to San Diego in 2006. She has been with 4 Paws since 2013 and is a bilingual asset to our team. She is currently attending Grossmont College. She has 4 rescue pets at home - Charlie (11), Bonnie (9), Kitters (9) and Brodie (1) that she loves dearly. In her spare time Karla likes to spend time with her spouse, family and crafting. Gina is a San Diego native that has worked for Dr. Barnes since 2000. She has two rescue pets - the sweetest american bulldog named Ben and a tabby cat named Noah. In her free time she likes to walk / hike with Ben. She enjoys spending time with family and friends. 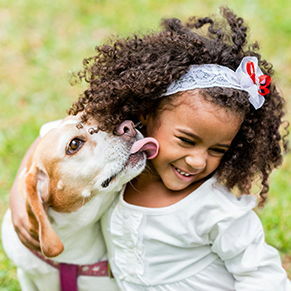 She is passionate about animals and loves to connect with pet owners as well. "I am so grateful for Dr. Barnes and his staff. He has cared for our family dogs for many years. He is so thorough and explains everything. I value his experience."